Last week, Sprint (NYSE:S) unveiled a new limited time promotion, offering customers who switch from other carriers an unlimited plan priced at just $15 a line, which is well below the company’s standard $60 plan. The plan doesn’t appear to have much fine print, and counts as one of the more aggressive offers by Sprint in recent months. While the offer could allow the carrier to bolster its postpaid phone subscriber adds, it could come with some risks as well. In this note, we take a look at what the offering could mean for Sprint. The deal is limited to online sales and it will not be available via Sprint’s retail stores. This could help the carrier cut selling, marketing, and some tech support-related costs compared to its regular plans. The incremental impact of the plan on Sprint’s network could be minimal, as video is throttled to 480p, while the company also notes that speeds will be slowed down if the network is congested. Customers will need to sign up for AutoPay, meaning that collections should also be better. Sprint says that it typically doesn’t make money for the first year during its regular promotions, implying that the costs of the current deal may not be substantially higher than its other deals the company has offered in the past. Last year, the company offered Verizon subscribers who switch to its network a full free year of unlimited voice and data service. 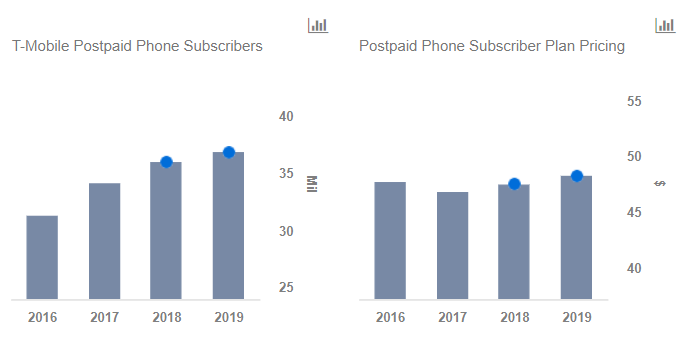 Moreover, wireless is largely a fixed-cost business, and Sprint is likely to see relatively low marginal costs of adding subscribers, given that its network is not likely to be approaching saturation, unlike some of its larger rivals. That said, the deal could come with some risks as well. For one, Sprint’s ARPU could decline in the near term, as it may be adding on many low-paying subscribers. Churn figures may also rise down the line if some takers of this offer decide not to continue their service when the promotional pricing expires after a year. Separately, the deal could have some implications for Sprint’s M&A prospects with regulators. Sprint and T-Mobile reached an agreement to merge in late April and there is a possibility that promotions such as this, which effectively make the wireless space more affordable for customers, will run counter to the narrative that a market with three carriers will be more attractive than a four-carrier market.